The recently launched Mulder ThirtySix, named M/Y Delta One has successfully completed her sea trials off the coast of the Netherlands, from the marina of Scheveningen. With naval architecture by Van Oossanen Naval Architects, exterior design by Claydon Reeves and interior design again by the British designer and in conjunction with Vickers Studio, the full aluminium Mulder ThirtySix exceeded expectations. Her patented FDHF hull shape behaved very well at sea, with winds up to six Beaufort scale on the North Sea during sea trials. 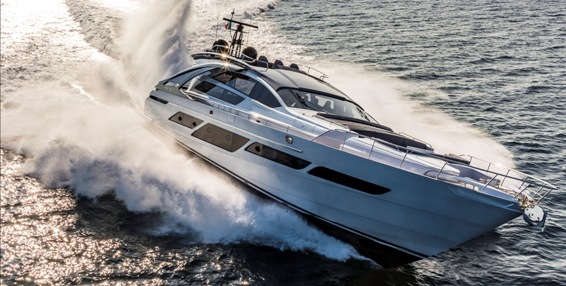 Driven by twin Caterpillar 1150hp engines, her top speed of 16.8 knots is matching calculations, as expected. At a cruising speed of 15 knots with an engine load of 67% performed amazingly comfortable. Due to the great synergy between her owners, IYR as owner's representatives, the crew, Mulder Shipyard, Van Oossanen and Claydon Reeves plus Vickers Studio, the Gross Tonnage of 298 has been meticulously optimized at all areas on board. Studious engineering, combined with striving to achieve the highest quality by all parties involved, the 36.00 meter yacht offers generous space to ten guests in five luxurious designed staterooms. The efficiently created tender bay area features a Williams 625 Dieseljet, two Yamaha GP1800 jetski's, Seabobs and extensive windsurf-gear. Mulder Shipyard will present the Thirty Six at the Monaco Yacht Show in end September. 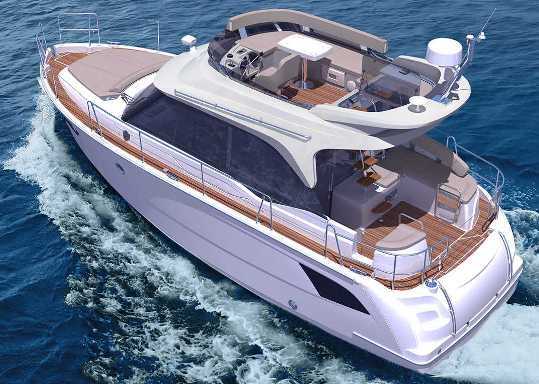 Bavaria E series continues to expand and here the German boat builder presents the E34 Fly, a flybridge version for the E34 launched in Summer. Just over ten meters in length the E34 Fly offers a flybridge deck with a helm station to port side, and a J-shaped dinette to starboard. For the remaining the E34 Fly offers the same interesting spaces of which is the two double both en-suited cabins, one forward and another aft. Living and galley are located on the main deck, with the helm station located in the unusual astern location by the patio door. Power comes standard from a single Volvo 109hp engines, with an optional 220hp being available. Propulsion is line shaft. Launched in the early part of Summer 2017, the new Raffaelli 50 Compass Rose Evo, is an evolution of the original Compass Rose which launched in 2001 and is one of the recent successes for the Pesaro located and long standing family owned boat builder. The new 50 Compass Rose Evo keeps the hull of the old model, but revisits the super structure and interior with a new design coming by Classtudio of Antonello Lucio Pontevolpe. The interior of the new Raffaelli Compass Rose Evo also has been changed with the inclusion of a midships located full beam owners stateroom, choice of two or three shower heads, and galley moved astern. Hull one also featured a technical change and was powered by the optional Volvo 550hp engines with IPS pod propulsion. With this set up the 50 Compass Rose Evo in its first sea trails allowed for a fully loaded top speed of 34 knots, with light loaded trials making it up to the magical 40 knots. During the Sydney boat show Riviera revealed details for two 39 foot project models set to launch in 2018. 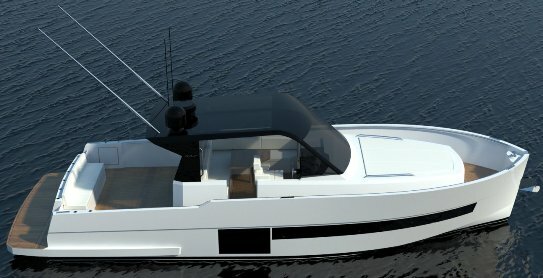 Both new models will share the same hull, and are to be powered by twin Volvo 370hp engines IPS pod propulsion system. The first model shown here is the 39 Open Flybridge which follows Riviera signature World famous home grown style of exterior looks. The Rivera 39 Open Flybridge will offer two cabins sleeping five in total; owner cabin forward, and three berth midships cabin. The two cabins will share a spacious shower head located to starboard in between the cabins. Living is all located on the main deck which will have an L-shaped dinette and dual seat helm station to port side, and an L-shaped and relaxing couch to starboard. The aft cockpit deck offers interesting open spaces which is joined by a mezzanine to port side equipped with a small cocktail table, and BBQ grill set up on the aft bulk head. 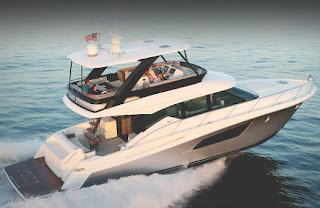 While not selling itself as a sport-fisherman, the aft helm station on the flybridge and free aft deck space makes it easy to use the Riviera 39 Open Flybridge for fishing. 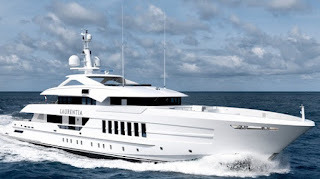 Heesen Yachts is proud to announce the delivery of the 55m YN 17755, formerly known as Project Alida. Her new Owners christened her Laurentia. Heesen YN 17755 combines efficiency, performance and style in a design package of 740 GT, with elegant yet muscular clean lines by Omega Architects. This steel-hulled displacement motor yacht sets a new standard in superyacht performance. During the sea trials, which were held in the North Sea at the beginning of August in moderate sea conditions, YN 17755 exceeded her contractual speed and reached a top speed of 16.6 knots. The vessel proved to be highly responsive, accepting steering commands immediately. The use of large rudders in conjunction with a powerful steering unit makes for a very quick reaction, as does the high pitch of the propellers. The overall effect instils great confidence in the captain when maneuvering in strong wind conditions. For YN 17755 the owner appointed Ramon Alonso at RADYCA, a Miami-based design firm, to create an interior design that promotes luxury, relaxation and entertainment throughout the yacht. A consistent use of neutral hues is found in open-grain white oak and different tones of wengé, taupe and grey leathers, wool carpets, and light textured suedes. White Arabescato and Grecale brown marble slabs emphasize the purity of the design.The loose furniture was carefully selected from various European and American brands and each piece was customized to fit perfectly and adapt to the interior scheme. Hand-stitched leather panels and accents play in contrast with the light suedes and dark wengé wood in different tones and finishes. Laurentia is a fantastic new addition to the fast growing Heesen fleet and will turn heads wherever she cruises! Since a few years Overmarine Mangusta have been expanding into new type of yachts and while its core market remains that of the big hard top super sport yachts which made its name famous, the 2016 first launch of the 42 Oceano, and the introduction of the new GranSport range shows a more diversified future for the Viareggio yacht builder. This project of the new 45 GranSport is a design to Alberto Mancini who is both responsible for the interior and exterior lines. In the 45 GranSport Mancini presented a hybrid type super sport yacht with a semi wide body area forward, and a beach club to aft. Guest accommodation will be for six double cabins, while crew space is for seven persons. To be build of aluminium, the 45 GranSport which was first shown as a 44 project model earlier this year will be powered by twin 2600hp MTU engines, which should allow for speeds up to 26 knots, and a cruise of 20 knots. Range at cruise is for 1000 nautical miles, or slow down to 11 knots and this increases to 3000 nm. Started in January 2016, this all-aluminium Ginton designed Wim Van der Valk 27m Continental Two titled M/Y Anemeli was delivered on schedule in August 2017. She features a round-bilge fast displacement hull painted in an elegant silver metallic color. 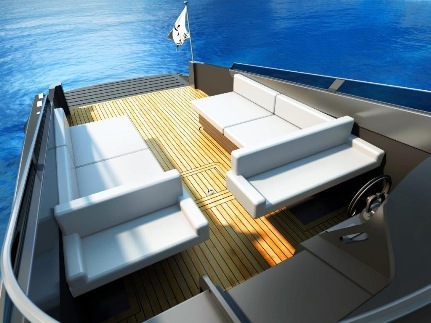 Her wide beam ensures an exceptionally spacious interior as well as lots of lounging space and ample accommodations. A rare feature is the bulb she sports on the submerged section of her hull, which artificially extends the waterline, increasing her speed and efficiency. In another departure from previous Van der Valk vessels in this size range the tender is stored on a multi-functional Opacmare Transformer platform aft, which also features a panto-graph system enabling gangway, passerelle, and swimming platform usage. 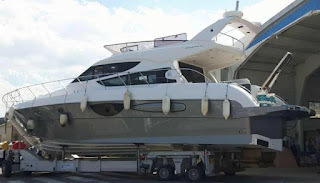 This solution allowed the flybridge deck to be given over entirely to leisure activities. The flybridge in fact provides plenty of room for an outdoor steering position, a large U-shaped dining area, a shaded wet bar with several stools and pantry, and a sunbathing area. Inside this hull one of the 27m Continental Two flybridge series follows Wim Van Der Valk robust cherry wood interior which reflects a classical nautical nature. The floating spiral staircase in the center of the main deck that leads up to the flybridge is a delicate see-through structure that leaves lines sight open, while lateral doors open onto the gangways on either side. The indoor steering position forward is flanked by a hangout space for guests who enjoy watching the action at the helm. Below deck 27m Continental Two boasts four cabins with ensuite facilities, including two twins, a VIP and a full-beam master suite amidships. The compact crew area in the bow is directly accessible through a custom hatch on the main deck forward. At the explicit request of the owner, a keen fisherman, there is a large freezer next to the lazarette aft of the engine. This space also accommodates two SeaBobs, diving gear and an oversized bathing platform. Anemeli is the first aluminium yacht in the world to be fitted with the new large Man 1900hp engines. Half-loaded Wim Van der Valk 27m Continental Two deployed a maximum speed of thirty knots, two more nautical miles per hour more than the Dutch builder had calculated before completion. This Wim Van der Valk also featured a European first for being equipped with the Veem VG120 gyro stabilizer.